Do you constantly have to work around the limitations of your finance system? For some there may be challenges with regards to reporting. For others there may be challenges relating to multiple locations, multiple companies or international aspects of their business. To see how the award winning Infor SunSystems (formerly Sun Accounts) can help you address these challenges, choose from the key features below. Alternatively, take a look at the range of SunSystems modules. Most finance systems employ complex segmented account codes to analyse your financial data. They are difficult to maintain and result in a long and cumbersome Chart of Accounts. SunSystems is different. Its innovative design is more flexible and easier to manage. It offers a greater depth of analysis and a simpler, more intuitive Chart of Accounts. You will be able to realign reporting to meet evolving business needs and immediately report on any change you make. Complete ad hoc or period end reporting in minutes rather than days or weeks. Using familiar desktop applications you can quickly and efficiently create reports that highlight trends, patterns, and exceptions. And since minimal IT support and involvement are required, maintenance is easy, too. Publish reports in any number of formats including internal management, UK GAAP, US GAAP, and IAS (or IFRS). Information can be produced in any form you choose. 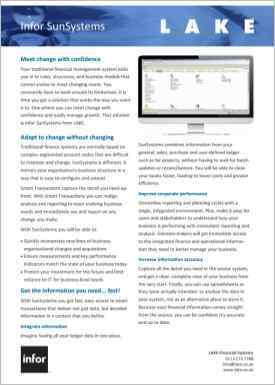 It can be spreadsheets or pdf documents delivered via email, via self-service dashboards or your SharePoint Intranet. Connect all your front and back office systems. There is no need to re-key information. Deliver financial management tightly integrated with systems for payroll, membership, student records, investment, production and many more. LAKE solutions are used by organisations as diverse as Not-for-Profit, Financial Services, Education and Upstream Oil & Gas. Its innovative and flexible design makes it an ideal solution to their needs. LAKE has been implementing SunSystems solutions in these sectors for more than 25 years. Our experience leads to a better understanding of your needs and rapid implementation. Connecting to SunSystems will reflect the way you want to work. We support both hosted and on-premise installations. LAKE Cloud is a managed service where we take care of all the hardware, software and database management activities associated with your LAKE solutions. Infor SunSystems is a comprehensive financial management solution. The extensive range of options includes fixed assets, recurring invoicing, allocations, budget management, debtor management, electronic funds transfer, budgeting, forecasting, expenses and order management. At the heart of the solution is a single, integrated ledger that combines the functionality of general ledgers, sales and purchase ledgers, cashbooks and user-defined ledgers for projects. It is a comprehensive multi-company and multi-currency solution with exceptional flexibility to analyse financial, statistical, and other business information. Sales Management combines with integrated modules for Recurring Invoicing and Collect Debtor Management to provide a comprehensive solution that includes sales order entry, sales invoice processing, contract management, sales reporting, pricing and credit management. Proactis for SunSystems harnesses the power of web and email technologies to help organisations work efficiently and seize control of spend. Using simple Internet shopping principles, staff can quickly request and order goods or services. Workflow ensures that purchases are made in accordance with established policies and procedures. To find out more, take a look at Purchase Management. Maintain records for an unlimited number of assets with this powerful asset management component of the SunSystems suite. Visit our Fixed Assets page for details. Q&A (formerly known as Vision) is the intuitive reporting and business intelligence tool that operates within Microsoft Excel. Visit our Query & Analysis page for details. Automates the apportionment of expenses in accordance with pre-defined criteria such as percentages, ratios of fixed amounts. 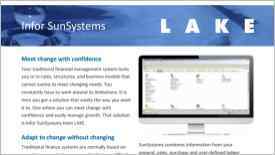 LAKE has been a SunSystems Channel Partner for more than 27 years. Our consultants are amongst the most experienced in the UK. The selection of LAKE is frequently cited as a significant factor in the selection of a new Finance system. I would highly recommend LAKE consultants. Everyone we have dealt with really knows their stuff and provided a good level of challenge throughout the implementation process; they were not shy in suggesting better ways to do things. You need that challenge in a project of this scale." "We went on a site visit to another college and they couldn’t sing LAKE’s praises highly enough. This confirmed our view that LAKE would provide exactly what we were looking for." From time to time people refer to Sun Accounts, Sun Accounting, Sun Financials and SunBusiness. If you are looking for one of those brands you have come to the right place. SunAccounts is now known as Infor SunSystems. Select from available dates, times and area of interest.